After a nearly twenty-year long game of cosmic hide-and-seek, astronomers using ESA's XMM-Newton space observatory have finally found evidence of hot, diffuse gas permeating the cosmos, closing a puzzling gap in the overall budget of 'normal' matter in the Universe. A peculiar X-ray source spotted in the globular cluster NGC 6540 as part of a collaboration between scientists at the National Institute of Astrophysics (INAF) in Milan, Italy, and a group of students from a local high school. In 2005, ESA's XMM-Newton saw this source undergo a flare that boosted the luminosity of the source by up to 50 times its normal level for about five minutes. Too short to be an ordinary stellar flare, but too faint to be linked to a compact object, this event is challenging our understanding of X-ray outbursts. Scanning the sky for X-ray sources, ESA's XMM-Newton X-ray observatory has been busy with the XXL Survey, its largest observational programme to date. The second batch of data from the survey has just been released, including information on 365 galaxy clusters, which trace the large-scale structure of the Universe and its evolution through time, and on 26 000 active galactic nuclei (AGN). By examining two large regions of the sky at great sensitivity, this is the first X-ray survey to detect enough galaxy clusters and AGN in contiguous volumes of space to make it possible for scientists to map the distribution of these objects out to the distant Universe in unprecedented detail. 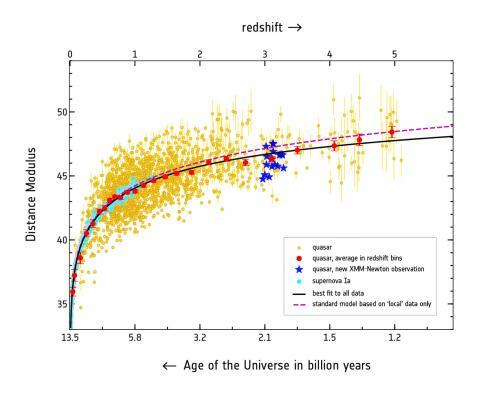 The results are compatible with expectations from the currently-accepted cosmological model. Investigating the history of our cosmos with a large sample of distant 'active' galaxies observed by ESA's XMM-Newton, a team of astronomers found there might be more to the early expansion of the Universe than predicted by the standard model of cosmology. According to the leading scenario, our Universe contains only a few percent of ordinary matter. One quarter of the cosmos is made of the elusive dark matter, which we can feel gravitationally but not observe, and the rest consists of the even more mysterious dark energy that is driving the current acceleration of the Universe's expansion. This model is based on a multitude of data collected over the last couple of decades, from the cosmic microwave background, or CMB – the first light in the history of the cosmos, released only 380 000 years after the big bang and observed in unprecedented detail by ESA's Planck mission – to more 'local' observations. The latter include supernova explosions, galaxy clusters and the gravitational distortion imprinted by dark matter on distant galaxies, and can be used to trace cosmic expansion in recent epochs of cosmic history – across the past nine billion years. Artist’s impression of two ‘chimneys’ funneling hot, X-ray emitting material from the centre of our Galaxy into two huge cosmic bubbles. The two galactic chimneys were revealed using data collected between 2016 and 2018 by ESA’s XMM-Newton space observatory, which completed the most extensive X-ray map ever made of the Milky Way’s core. 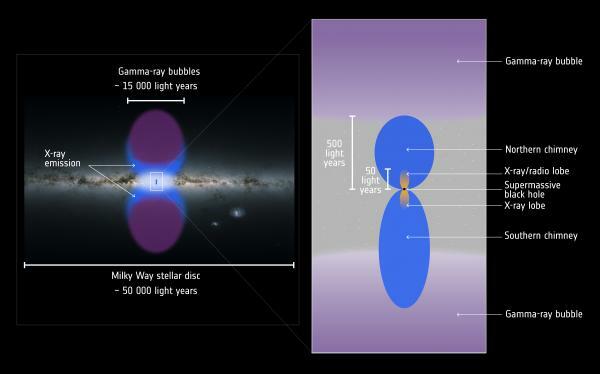 The giant, gamma-ray emitting bubbles had been discovered by NASA’s Fermi Gamma-ray Space Telescope. They form a shape akin to a colossal hourglass, spanning about 50 000 light years from end to end – comparable to the size of the Milky Way’s stellar disc, and to around half the diameter of the entire Galaxy. The two hot channels found by XMM-Newton stream outwards from Sagittarius A*, our Galaxy’s central supermassive black hole, and extend each for hundreds of light years, finally linking the immediate surroundings of the black hole and the bubbles together. Scientists think that these ‘chimneys’ act as a set of exhaust pipes through which energy and mass are transported from our Galaxy’s heart out to the base of the bubbles, replenishing them with new material.